If for any reason you want to uninstall VMware Fusion on your Mac and you have version 3.0 or earlier, you can use its native uninstaller. 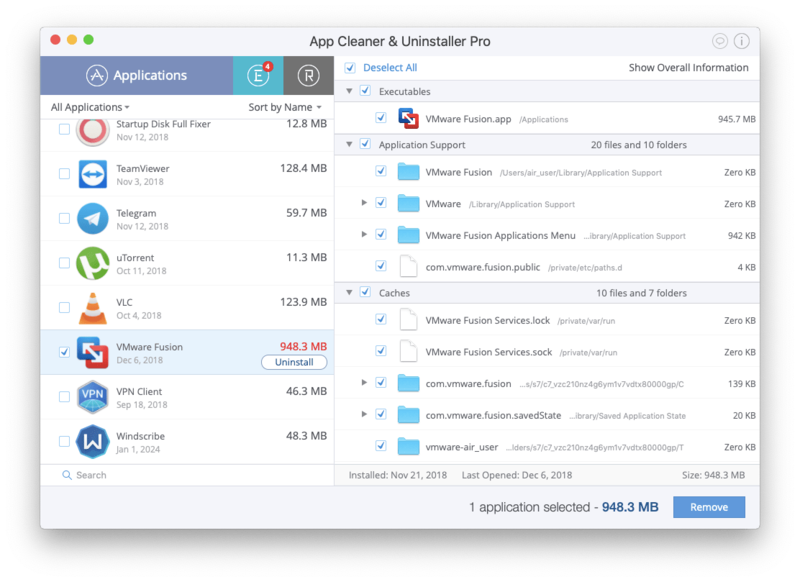 If you cannot find or run the Uninstall VMware Fusion file on your Mac or you have the VMware Fusion 4.0 version and later, we are happy to share with you two ways to properly delete VMware Fusion. So, read on to learn how to uninstall VMware Fusion on a Mac completely. 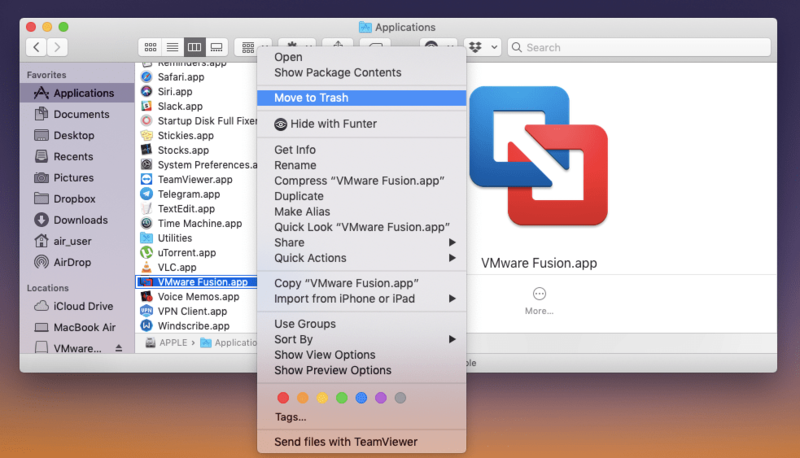 Open the Applications folder → select VMware Fusion.app → right click and select Move to Trash to get rid of the application’s executable file. 4. Empty the Trash bin to completely get rid of the VMware Fusion application. The second way is much easier, thanks to a special program for Mac users – App Cleaner & Uninstaller. It allows you to remove more than 1,000 applications and their remaining files in just a few clicks. Select VMware Fusion in the list of the items in the Applications tab. All of its service files will be marked automatically. Click to Uninstall. 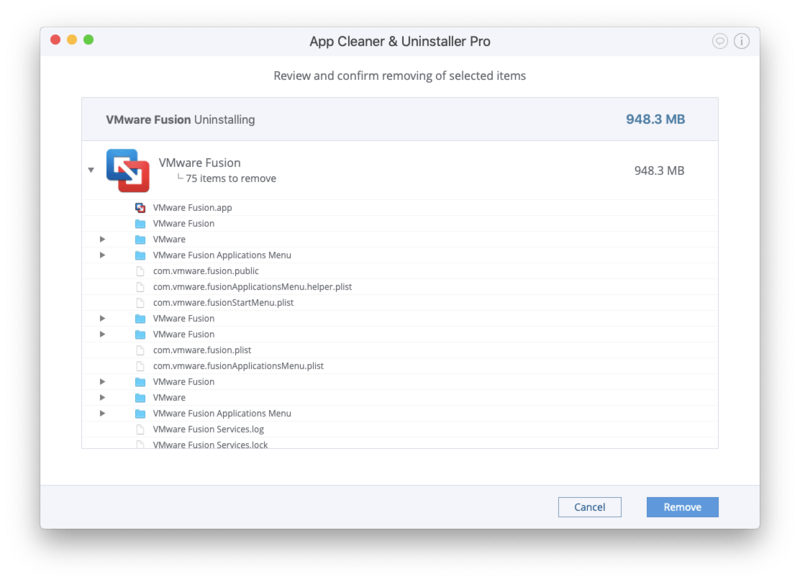 Complete the VMware Fusion for Mac uninstallation by emptying the Trash bin. Depending on the diversity of applications and their versions, there could be more types of service files, which may be hard to find manually. Therefore, we recommend using App Cleaner & Uninstaller to completely delete applications from your Mac. You can download the App Cleaner & Uninstaller free trial and start using it today.